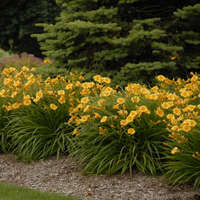 For those of us who have noticed the many many drifts of 'Stella de Oro' outside municipalities, lining streets, and 'decorating' businesses, here is a starter list that proves reblooming daylilies come in more than one color. *Please note* that this is not a complete list of reblooming daylilies. 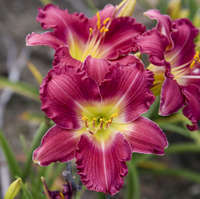 There are many reblooming daylilies, such as 'Happy Returns', which did not make this list because we wanted to share some of our absolute favorites, not just what's popular. It is also worth pointing out that the daylilies in this article (with the exception of 'Baby Moon Cafe') all have flowers over an inch larger than 'Stella de Oro'. Easily the most popular Dalily on the market, 'Stella de Oro' has become a landscaper's favorite. 'Stella de Oro' made waves when it was first introduced thanks to its long lasting blooms and persistent rebloom into early fall. 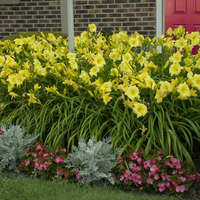 It even won the Stout Silver Medal in 1987, which is the highest award a daylily can win. 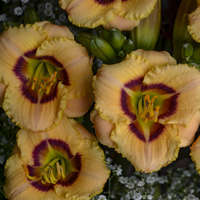 'Going Bananas' is another incredibly popular reblooming daylily, this one from Proven Winners. Where 'Stella de Oro' is more of a golden yellow, 'Going Bananas' is banana yellow. 'Going Bananas' also has a larger flower size and will continue to bloom well into fall. A triumph for hybridizer Darrel Apps. 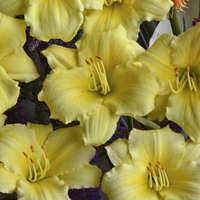 'Big Time Happy' improves with larger flowers and a long period of bloom. 'Big Time Happy' is also recognizable by its flowers that open flat, whereas 'Stella de Oro' retains a bit of a trumpet shape. New from Proven Winners comes 'Orange Smoothie'. 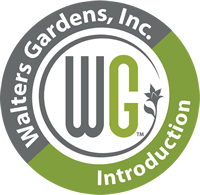 This variety likewise has the reblooming quality necessary to make the list, but does so also with a variety of improved flower characteristics. Note 'Orange Smoothie' for its prominent eyezone, ruffled piecrust edging, and diamond dusted petals. You can also expect cookie cutter consistency when comparing the blooms on this plant. 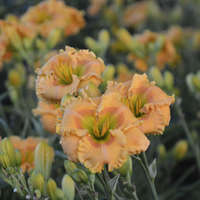 'Orange Smoothie' also stands a nice 6in taller than 'Stella de Oro', with a clump size to match. Four way branching also means that at any given point in time, 'Orange Smoothie' will have more blooms than 'Stella de Oro'. 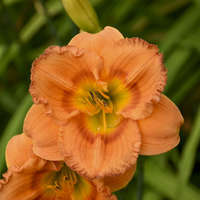 Staying in the vein of orange reblooming daylilies, EARLYBIRD ORIOLE™ is another one of note. Much larger, 5in pumpkin orange flowers elevate this plant, as does its early blooming. Matching EARLYBIRD ORIOLE™ is CARDINAL™. 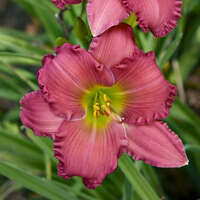 This was the first red daylily to be an early, continuous blooming variety and hardy to northern zones. 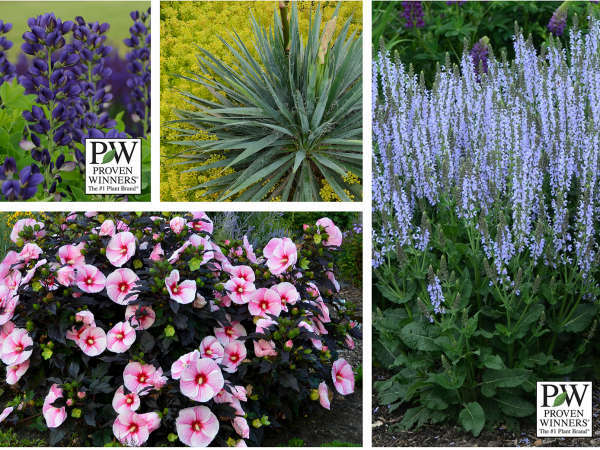 Gardeners in Zone 6 can expect about 100 days of color from a mature plant. We consider this a premium daylily. Cherry red blossoms have a bright yellow halo and apple green throat. Blooms all summer and into fall. 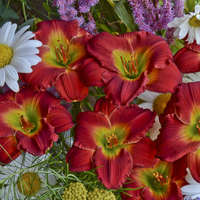 Perhaps the highest quality bloomer of the Happy Ever Appster™ Daylilies, 'Passionate Returns' thrills with months of rosy red flowers. 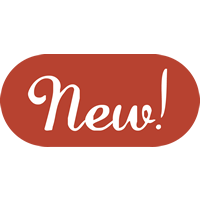 Similar to other members of the Happy Ever Appster™ series 'Red Hot Returns' and 'Passionate Returns', 'Romantic Returns' continues the expectation of extremely long season of color. 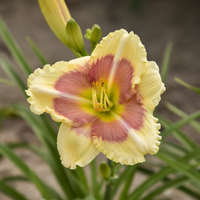 Compared to 'Passionate Returns', this daylily is a deeper shade of pink with larger flowers. Perhaps the closest one in actual flower size to 'Stella de Oro' is 'Baby Moon Cafe' at a refined 3in. 'Baby Moon Cafe' also differs with its colorful wine purple eye and diamond dusted blooms. This is a very strong grower thanks to its tetraploid parentage and has an exceptionally high bud count by consequence. 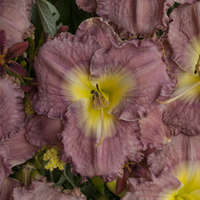 Another daylily with a contrasting eye to make this list, 'When My Sweetheart Returns' matches the height of 'Stella de Oro' though its blooms are a full inch larger. 'When My Sweetheart Returns' also opens almost perfectly flat, unlike 'Stella de Oro' who has a slight trumpet shape. While it might not have as much bloom longevity as 'Stella de Oro', 'Blackthorne is certainly more eye-catching! Huge wine purple eyes dominate the flowers and have a matching picotee edge outlining the petals. 'Blackthorne' will also stand about 12in taller in the garden than 'Stella de Oro'. 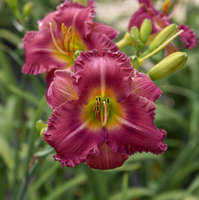 'Magic Amethyst' is another of the Tetraploid daylilies. This typically means it is a stronger grower than Diploids (like 'Stella de Oro') and frequently has a better floral performance as well. 'Magic Amethyst' is an exceptionally early blooming variety, starting weeks before 'Stella de Oro' and producing large 5½in flowers. 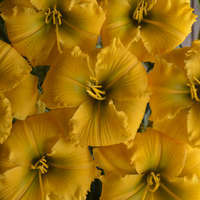 A gold daylily like 'Stella de Oro', but with many differences. Where 'Stella de Oro' is more of a yellow-gold, 'Elegant Explosion' is more golden orange. You can also expect 'Elegant Explosion to start blooming later, though it will still be going after 'Stella de Oro' finished up. 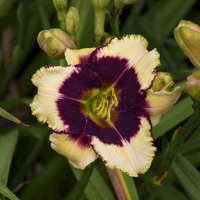 It shares the name 'Stella' and it may be the most similar of the daylilies on this list. 'Stella Supreme' has comparatively triangular flowers to 'Stella de Oro', though they are slightly larger and more of a lemon yellow. 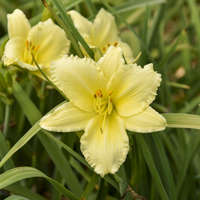 This variety also matches 'Stella de Oro' quite well in height and bloom season.